#GTG STM600 - Price: $ 80.00 - $ 64.00 On Sale! 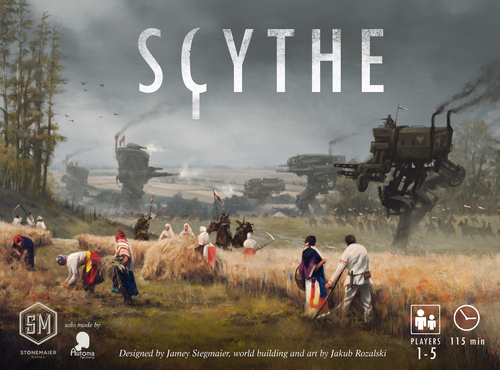 Scythe: The Wind Gambit contains two modular expansions: airships and resolutions. In the airship module, 2 airship tiles are randomly paired at the beginning of the game (1 passive and 2 aggressive; there are 16 total tiles). Each player’s airship miniature (a new type of unit; 1 big miniature for each of the 7 factions [the sculpts are identical, and the bases are different colors to match the factions]) has those abilities, as well as the core ability that airships are free to move onto any territory (land or water) and across rivers. Each player starts with their airship on their home base, so they can start moving out of their home area right away. The airship miniatures measure 101x33x41mm, and they have clear, plastic, removable stands/bases. In the resolution module, resolution tiles add a twist to the way each game ends. There are 8 of them, and 1 will be used each game. They often have an impact in the decisions you’ll make throughout the game. #GTG STM631 - Price: $ 25.00 - $ 20.00 On Sale! #GTG STM615 - Price: $ 30.00 - $ 24.00 On Sale! © 2007 Cipher Games & Comics, Including the name and logo, layout, design, and functionality.